The ability to forge your own weapons and armor out of various metals found in RuneScape can be quite a useful skill. It can also be profitable, since as you gain experience and are able to smith better armors and weapons, the more money you will make from selling them. As a reward from the Forgettable Tale of a Drunken Dwarf Quest you will get 2 Mature Dwarven Stouts which will increase your Mining and Smithing levels by 2, not just the ordinary 1 level. When Brewing Beer there is a chance that it will become Mature and give extra bonuses. To make it more likely that it becomes Mature you can add "The Stuff" which is something you can buy as a reward from Trouble Brewing. Now that you've got all of your ores together, you should smelt them into bars so that you can make weapons and armor out of them. 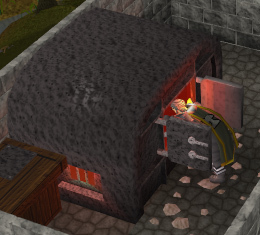 Just bring the ores to a Furnace ( ), and choose the 'Smelt' option of the right-click menu. You'll be able to choose which kind of bar to make, as well as the number of bars to smelt. By default you will create the maximum number of metal bars using the available ores in your inventory. Your character will then begin smelting the ores and creating the appropriate number of metal bars. Another way to smelt all of your metal bars is to cast the Superheat Item spell on the ores. This of course requires 4 Fire Runes and 1 Nature Rune, but it can be much faster than walking to a furnace to smelt your bars of metal. If you smelt Iron ore with Magic, all ores will be smelted. The 50% for smelting Iron ore means that you will only get about half of the ores that you try to smelt. The other ores are wasted and just disappear into the furnace if they aren't good enough. By wearing a Ring of Forging, you'll have a 100% chance to smelt Iron into bars, and each ring has 140 uses. Smithing Gauntlets - Members have a chance to have their Steel Gauntlets enchanted into GoldSmith Gauntlets after the Family Crest quest. When you smelt a Gold Bar while wearing these, you'll earn 56.2xp per bar. Elemental Bars require you to have completed the Elemental Workshop Quest. Blurite Bars require you to have finished the Knight's Sword Quest. Free-players: Al Kharid and Falador. Members: Edgeville (requires completion of at least one difficulty level of Varrock Tasks), Port Phasmatys, Shilo Village, and Neitiznot (accessible during the Fremennik Isles Quest). Using the World Map, you can find other locations for furnaces. With your metal bars in hand, it's time to make some armor, right? Not quite. You first need a Hammer to work the metal with, and you can buy one from any local General Store. Now you can begin smithing items by finding an Anvil and using a metal bar with it. This will bring up a graphical menu with all of the different weapons, armor, and other items you can make. White Name - You're a high enough level to smith the item. Blacked-Out Name - You need a higher smithing level to smith the item. # of Bars in Green - You have enough bars to make the item. # of Bars in Red - You need more bars in order to smith the item. Now you can choose the item you wish to smith, and if you have enough bars and a high enough level, you will smith it. You can right click on an object in the smithing menu and select to make multiple items at once. This is much faster than just making one item at a time. There are many anvils ( ) that you can smith from throughout RuneScape. The most desirable location for free-players are the ones in Varrock, located south of the western bank. For members, the same location mentioned before still applies. However, some other locations include Yanille and Seer's Village. Using the World Map, you can find other locations for anvils. Blurite Bolts 8 17 1 Requires you to have completed the Knight's Sword Quest to make. Blurite Crossbow Limbs 13 17 1 Requires you to have completed the Knight's Sword Quest to make. Elemental Shield 20 20 1 Used in the Elemental Workshop Quest. Elemental Helmet 20 20 1 Can be made after the Elemental Workshop Quest. Mind Shield 30 30 1 Can be made after the Elemental Workshop Quest. Mind Helmet 30 30 1 Made during the Elemental Workshop II Quest. Lunar Helm 1 25 1 Used During the Lunar Diplomacy Quest. Golden Bowl 50 30 2 Used in the Legends Quest to carry Holy Water. Golden Cannonball 50 37 1 Used in the Between A Rock... Quest to fire a hole through a magically sealed wall. Golden Helmet 50 30 3 Used in the Between A Rock... Quest to protect you while inside the cave wall. Dragon Sq Shield 60 75 Left & Right Shield Halves. Used for completing the Dragon Sq Shield. Godsword Blade 80 200 Godsword Shard 1, Godsword Shard 2 & Godsword Shard 3 Used to create a powerful two-handed weapon with detachable hilts. Arcane Spirit Shield 85 1,800 Blessed Spirit Shield & Arcane Sigil Requires a prayer level of 75 to make after the Summer's End Quest. Divine Spirit Shield 85 1,800 Blessed Spirit Shield & Divine Sigil Requires a prayer level of 75 to make after the Summer's End Quest. Elysian Spirit Shield 85 1,800 Blessed Spirit Shield & Elysian Sigil Requires a prayer level of 75 to make after the Summer's End Quest. Spectral Spirit Shield 85 1,800 Blessed Spirit Shield & Spectral Sigil Requires a prayer level of 75 to make after the Summer's End Quest. Dragonfire Shield 90 2,000 Anti-firebreath Shield & Draconic Visage Used for completing the Dragonfire Shield. Dragon Platebody 92 2,000 Ruined Dragon Slice, Ruined Dragon Lump & Ruined Dragon Shard Created with a Blast Fusion Hammer at the Dragon Forge after the completion of the While Guthix Sleeps Quest. Pickaxes may be smithed after completing the Perils of Ice Mountain Quest. To make a spear, you need one metal bar and one log that corresponds to the metal type. Spears can only be made after the Tai Bwo Wannai Trio Quest and the first portion of the Smithing section of Barbarian Training. Spears can only be made on special barbarian anvils. Hastas are essentially one-handed spears and made in the same fashion as spears. However, you can only make hastas on a special anvil and must have completed the Smithing portion of Barbarian Training. There are some hammers in RuneScape that serve a special purpose and have certain requirements to obtain them. There are currently two special hammers in the game: The Sacred-clay/Volatile-clay Hammer and Blast Fusion Hammer. The Sacred-clay/Volatile-clay Hammer is a reward from the Stealing Creation Activity. Both hammers require at least level 40 Smithing to use. The sacred-clay variant of the hammer grants double the amount of experience per item made, while the volatile-clay variant grants 2.2 times the normal experience. Be aware though, there are some exceptions to what can give increased experience, such as quest items. Be aware that these hammers are not permanent and will disappear or morph into a different tool after a certain number of uses. The Blast Fusion Hammer is obtainable from the Blast Furnace Foreman after the While Guthix Sleeps Quest. He is located within the Keldagrim Blast Furnace Activity and sells the hammer for a whopping 1,000,000 gold pieces. This hammer is used to smith the Dragon Platebody at the dragon forge located in the Ancient Caverns. After smithing a Dragon Platebody, the hammer will disappear. A Dragon Platebody requires 92 Smithing to make. This hammer can be used as a normal hammer and will never disappear until you use it to smith a Dragon Platebody.